*** Used by countless Chinese language learners worldwide, Learn Mandarin - HSK 4 Hero is the most effective Chinese word and character learning app! The Hero Method allows you to quickly master Chinese characters by enforcing a recall and recognition process, essential for long-term memory. 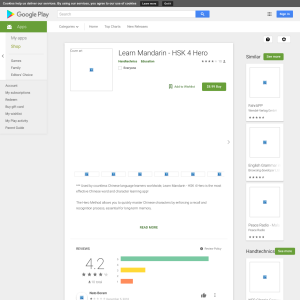 HSK 4 Hero covers 600 Chinese words, which are based on the Chinese level 4 proficiency exam (HSK 4). Audio for all words is available at the tap of a button. This app supports both simplified (mainland China) and traditional (Hong Kong, Taiwan) Chinese characters.